PC-based HMI solution for single-user systems directly at the machine. 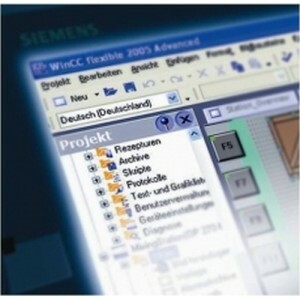 SIMATIC WinCC Runtime Advanced is available as a software package with 128, 512, 2 048 or 4 096 PowerTags. The term PowerTags is used to identify process variables and area pointers that have a process link to the controller. Variables without process link, constant limit values of variables, and messages (up to 4 000 bit-triggered messages) are also available for additional system performance. The range of functions of WinCC Runtime Advanced includes the centralized HMI components for visualizing and reporting, and it can be expanded to suit requirements and costs by using optional packages.